Ventrica – a fast-growing outsourced contact centre business with an impressive international client base. Ventrica is an award-winning, outsourced contact centre business based in Southend that started up during the height of the recession and now works on behalf some of the world’s leading brands including the likes of McDonalds, Jimmy Choo, New Look, Canon, UGG and Barratt Homes. Ventrica’s 300+ team provides multilingual eCommerce customer management and communication services in a host of different European languages for businesses across fashion, retail, insurance, finance, health, transport, construction and publishing. 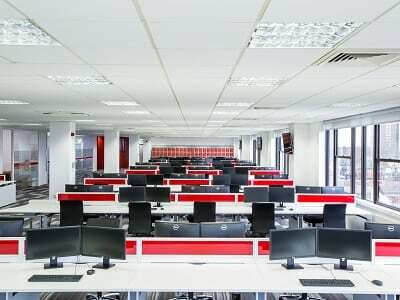 Ventrica, founded in 2010, has experienced phenomenal growth over the last few years, and continues to grow with the opening of a Penthouse Suite contact centre which will increase the company’s footprint to 19,000 sq ft and extend its provision from 280 to 480 jobs. According to analyst Forrester, European online retail sales are estimated to reach €378 billion by 2021. The boom in ecommerce across international borders over the last few years has helped fuel demand for outsourced customer service around the clock, including support for yearly peak events such as Black Friday when brands need to interact with thousands of customers over multiple channels from twitter through to webchat. With its expertise in customer care, digital and native multi-lingual speakers Ventrica has been ideally positioned to capitalise on this opportunity to become one of Southend’s largest employers. Ventrica has also recently acquired 35 new employees who were made redundant due to the closure of Converso Contact Centre also based in Southend-on-Sea. New employees will work across a range of customer service, regulatory and IT roles. The prestigious Direct Commerce Association award was won for Ventrica’s work with specialist footwear company VivoBarefoot (www.vivobarefoot.com) for whom it provides multi-channel and multi-lingual customer services. These resulted in increased e-sales of 300% and a 73% improvement in international conversion rates. Due to an increased demand for its omni-channel customer services, an additional site at another location is also part of the company’s future growth strategy for 2017, which will add a further 300 new seats. Ventrica is investing further in its digital capabilities with launching a wholly owned subsidiary, Ventrica Digital. The sister company was established in June 2016 in order to provide a new type and range of customised and results-driven social management services to UK businesses. The company is based at the same location as its parent company in Southend-on-Sea, and within its 80 seat Digital Centre. Ventrica Digital provides a range of digital services for different sizes of companies by managing, monitoring, reporting, growing and increasing reach on all social and digital platforms. Ventrica has been working with INVEST Essex, on projects to help the company to grow. INVEST Essex has been working closely with Ventrica to support them with site location and skills engagement. During this time Ventrica has expanded to premises twice the size, incorporated new skills techniques and taken on new staff. See here for more information on Ventrica.